EPSILON™ + 102 Hardener Product Information | Smooth-On, Inc. Specific Volume 24.3 cu. in./lb. EPSILON™ is a thixotropic epoxy coating that self thickens for brushing onto a variety of surfaces without sagging. Parts A and B mix together easily, and the mixture wets out uniformly. This product is not sensitive to moisture or humidity. EPSILON™ cures at room temperature to an impact resistant plastic which exhibits good compressive and flexural strength. EPSILON™ is color neutral, and cured material can be easily sanded, primed and painted. EPSILON™ is suitable for use as a protective, impact resistant coating for EPS or polyurethane foam. It can also be applied to plaster, concrete, wood and fabrics. This product is not sensitive to moisture or humidity and contains no VOC’s. 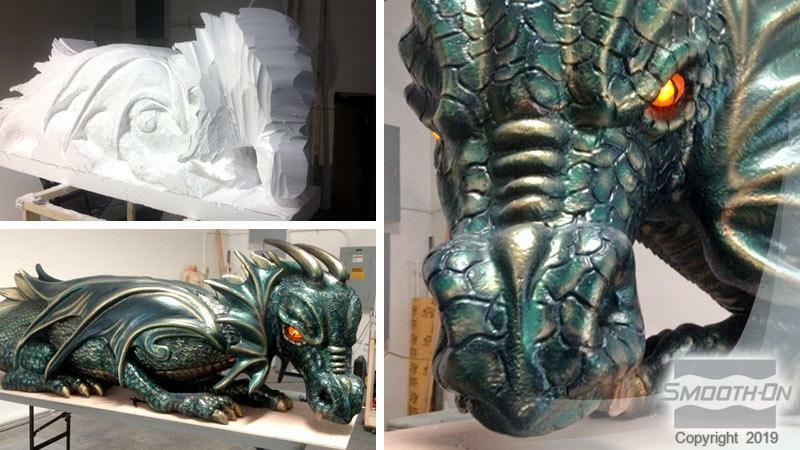 This dragon is formed on EPS foam then coated with Epsilon® before final sanding and painting is done. Epsilon® can be colored with SO-Strong® tints or UVO® pigments before application. Epsilon® provides a sandable, impact resistant finish on EPS foam. 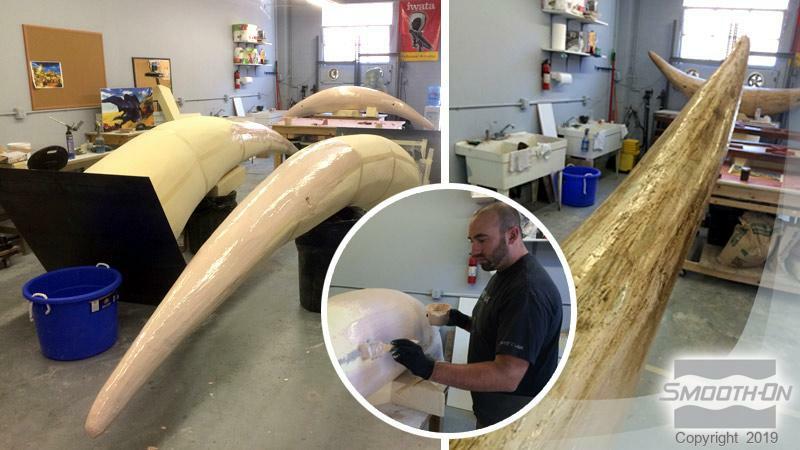 Frank Ippolito uses Epsilon® to make these large EPS foam archway. The coating offers a sandable, paintable, impact resistant finish. Materials should be stored and used in a room temperature environment (73°F/23°C). Elevated temperatures will reduce Pot Life. 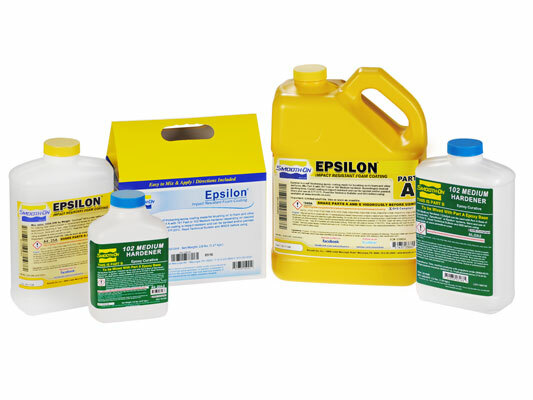 EPSILON™ Part A resin and Part B Hardener must be properly measured and thoroughly mixed to achieve full, high-strength, solid-cure properties. Important - Mixed EPSILON™ Resin with EpoxAmite™ PART B Hardener is exothermic, meaning it generates heat. A concentrated mass of mixed epoxy in a confined area such as a mixing container can generate enough heat to melt a plastic cup, burn skin or ignite combustible materials if left to stand for its full Pot Life. 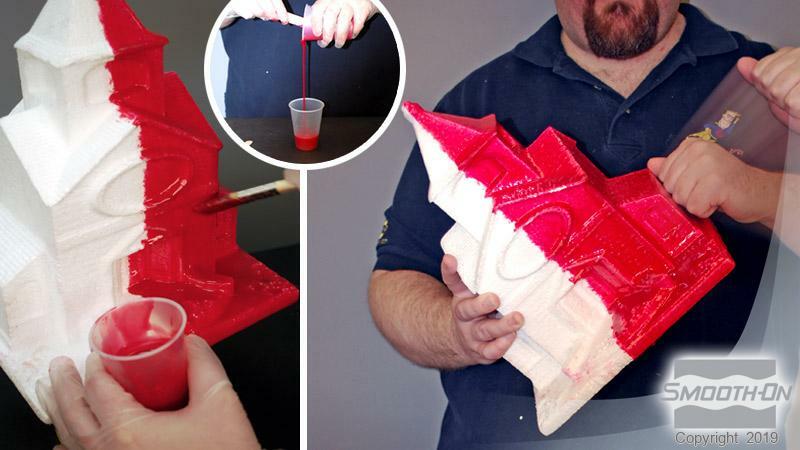 If a batch of mixed epoxy begins to exotherm, move it to an open air environment. 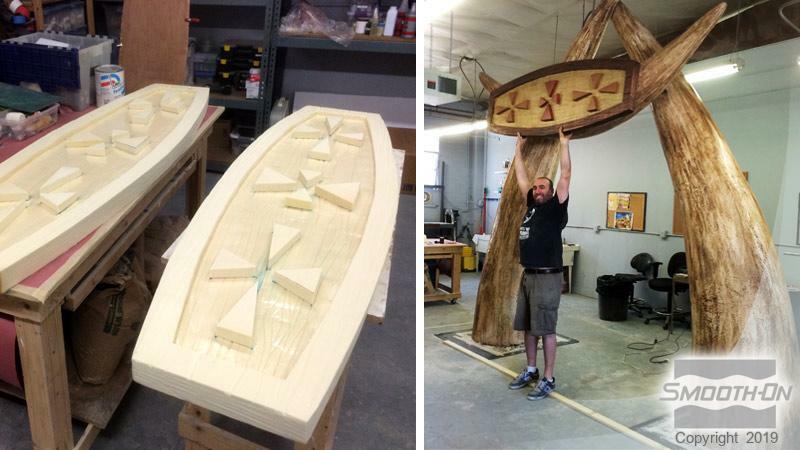 Adding Color - EPSILON™ Epoxy Surface Coat System can be colored with UVO™ or IGNITE™ colorants (from Smooth-On). Pre-mix colorant with Part A thoroughly and then add Part B. Apply In Thin Layers - two thin layers of EPSILON™ are recommended for a smooth, uniform coating. Using chip brush or roller, apply 1st thin layer to surface and let epoxy partially cure until “tacky hard”. Apply 2nd thin layer. Allow both layers to fully cure. Do not apply epoxy thicker than 1/8” (0.32 cm) per layer as this may cause sagging and result in an uneven cured coating. When coating areas of fine detail, using successive thin layers of EPSILON™ will allow a protective layer of material to be built up without obscuring the detail of the original surface. 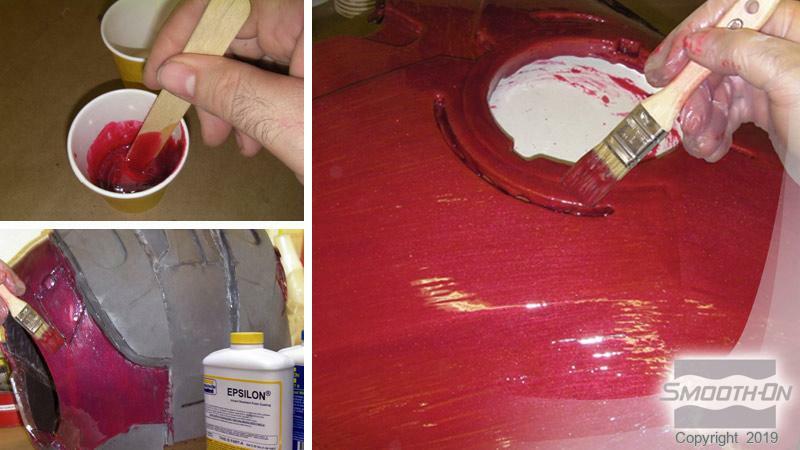 Painting – EPSILON™ can be painted and/or primed and then painted with acrylic enamel paints. Let paint fully dry before putting part into service. For best results, lightly sand surface prior to painting.